I'm shooting for the 50# mark by March 25 - my son's wedding day! I ordered a dress a size smaller than I usually wear! People aren't really commenting that they can see I've lost weight - except in my face, but my clothes are really loose - this is hard because I am just passing through - not planning on staying this size for long - so when do you get new clothes? Not yet. I'll just have to look goofy for awhile. I have some clothes in my closet that I can wear that had been too tight. My beautiful red leather jacket I used to squeeze to be able to button, now hangs on me. But I am not complaining! I still get a sort of "la-la-land" feeling come over me when I think that I could actually succeed at this and get to a healthy weight. I haven't been since 1979. So that seems like another lifetime ago - that seems like another person - and in a way - it is, I have carried another person's weight worth of fat everywhere I go for decades - for much longer than before I started to get overweight. I haven't shopped in normal ladies stores in forever. I hate the mall - it is totally depressing to go past all these stores where you can't find anything that fits. So I have avoided malls for years and years. It "shapes" every thing you do, everything you feel. It is an ever present cloud interfering with sunlight from getting through. And you soldier on because you have to, but there is this elephant in the living room you are trying to ignore and pretend isn't there. You can get pretty good at it. But anyone walking into your house immediately is aware of the elephant and is totally distracted by it. So, now that I am doing this, I find it hard to ignore with others I know or meet who could really benefit from this major life change. But just the same way I wasn't interested or able to do anything truly effective about it for 57 years, there is no way to proselytize this program - I think - until you are a walking billboard. Until your life is so unmistakably improved that you never have to mention it to anyone - they just see it with their own eyes - and start to wonder, and then ask and maybe because of your remarkable turn around, they consider it for themselves. I'm not there yet. I've lost this much weight before and gained it all back and then some. At this point, it is still way too subtle. 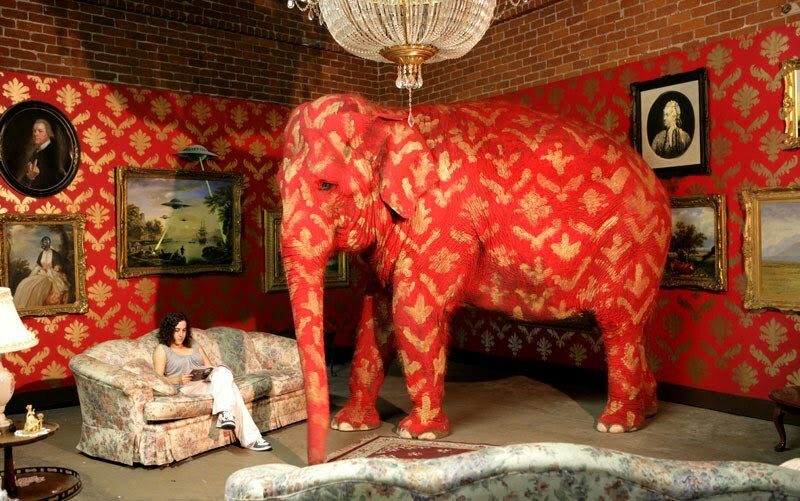 So if that red elephant in the picture lost a little weight, no one would really notice. When he is gone - then when visitors come to your door and you open it, and they are wanting to feed the elephant some peanuts they brought along, and there is no elephant - and they are now like, "HEY! Where's Dumbo? I brought peanuts!" and you have to say, "Sorry, Dumbo doesn't live here anymore," then you might be considered an expert on elephant removal. And that is OK - because the only way you can really get rid of Dumbo is to do it for yourself, not for others - not for their attention or praise or happiness. Eventually all those things lose their efficacy. You start resenting them even, for trying to change you - or whatever. My mom saw my weight creeping up in the early years of my first marriage and she offered to buy me a new wardrobe if I would get down to my normal weight again. My best friend told me about a wonderful man who thought I was really special and told her I'd have to beat the men off with a stick if I lost weight. My second husband, on our wedding night, said - "though you have lovely breasts, I wouldn't care if you were flat chested" - all in a well-meaning attempt to motivate me to lose weight. It had the opposite effect. It's good to remember that. As I get a little haughty in my progress toward my goal. So, though I have a very long way to go, I must say this feels different from any previous weight loss attempt. I've made it through several plateaus without giving up and reverting to old habits, and I have to maneuver around or over these hurdles of doubt and loneliness. It is lonely because I am neither abiding by my lifetime eating habits, nor have I lost enough weight to be considered healthy, fit and trim - but onward I go - moving in the right direction - not stopping - not looking back over my shoulder - just continuing to put one foot in front of the other with my goal in mind. My goal of totally unfamiliar hopes. I do admit that I hope to be benefitting more than just myself - there is a fine balance between being self-motivated and being selfish, or being motivated to help others and being co-dependent. I have also this additional motivation - that my time on this planet has a purpose, and unless I change the way I take care of myself, I will exit quite a bit shy of why I came and be unfit to accomplish what yet lies before me that I specifically agreed I would do. As I said, my weight influences every part of my life and sets boundaries that have gotten smaller and smaller each passing year. I have oft looked forward to the love and joy that awaits me on the other side of the veil, but don't want to face the reality that under-living might present to me there.